Why Doesn't My Marketing Work and What Can I do to Fix it? Our Marketing Medical service is designed for Business Owners who want an objective review of their Marketing Strategy and Tactics, are looking for some great new ideas that they can use straight away, and see almost immediate results. In this program, we review and analyse all your marketing materials, promotions and programs, and give a consultation on how your Marketing Systems can be improved and provide you with a written Profit Improvement Plan specifically for your business. The audit process can be completed in as little time as two weeks and will give you many practical strategies that you can implement straight away. You could be seeing results within weeks of starting to use our strategies. While we may recommend advertising, that is only one marketing channel, and many of the strategies we recommend cost little or nothing to implement. Often it just comes down to doing things differently. your ability to market yourself to them. It is not always the business that has the best quality products or service or the cheapest process that makes the most money. The businesses that make the most money simply know how to sell their products or services better than their competitors. Having effective systems for developing Good Relationships with your customers and business contacts. Maximising the effectiveness of all your promotions and advertising. Having marketing and operations systems is the secret ingredient behind all successful businesses. All of the successful franchise chains use these tested systems of ads, letters and promotions to gain customers quickly in new locations. They know that having a system for getting new customers, and for keeping them, is vital. Once they have this system, they simply keep duplicating it. You control the amount of business you have each week. Having effective systems for getting new customers, keeping your existing ones and for generating new business from them, means you are no longer at the mercy of the economy or fickle word-of-mouth promotion. Your staff morale and productivity increases. The systems make everyone accountable for what has to be done. Having a business that’s making good money makes everyone feel good. Your staff are happier because their jobs are secure. There’s no upper limit to the income you make if you have effective systems in your business. A good ad or letter can bring you ten times the sales of a bad one. Once you’ve tested them and proved that they bring results, you simply decide how often you have to use them to achieve the income you want. And best of all, having a marketing system means your whole operation can be put on auto-pilot. Once you find the promotions that work, you are no longer tied to your business. You can afford to hire others to do the tedious work for you. Of course, to develop all this for your business is not so easy. Let’s face it, we all have our strengths and weaknesses. Sometimes it’s hard to see how to improve your results without working harder or longer and that’s where Empower Business Solutions may be able to help you. By analyzing what you are doing now, we’ll be able to see what over-looked windows of opportunities you have, and you’ll get strategies to take advantage of these opportunities. This is how it works. Firstly, you give us copies of all your newspaper, magazine and Yellow Pages ads. 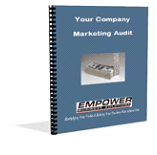 Copies of brochures, quotes, sales scripts, letters, and ads in other media. In fact, any promotion you have ever done. Then we’ll fill out an extensive questionnaire with you to help us understand your business better. Learn what promotions and costly marketing mistakes to avoid. How to get your existing customers to come back more often. How to increase the value and profit of each sale you make. Promotions to build your image in the marketplace and keep your name in front of your customers and prospects- while making profitable sales. Strategies for getting new customers and systems to keep them coming back and buying more from you. Advice on how to get the most out of your existing promotional material. During the consultation, we will suggest headlines and opening paragraphs for ads you can use, telephone scripts for you and your staff to use, sales presentations for your staff, outlines of Thank You and sales letters you can send, plus more- all aimed at increasing your business. It may take you 12 months to apply it all. Following the consultation, you get a prioritized Profit Improvement Plan. It contains the most important things you should do to immediately start increasing your business.